You have always been able to use segments and calculated metrics in Adobe Discover but now you can include segments WITHIN your calculated metrics! This greatly increases the flexibility of your metrics and will enable you to do more comparison work within Discover which historically has been very difficult. As we walk through this feature let’s use an example. Assume that you are interested in understanding the mobile vs non-mobile breakdown of your campaigns. Previously you could segment to get the same data but now we can build out metrics that make this easier and help to differentiate mobile from everything else. This is useful since, by default, there is only one mobile-specific metric in Discover–mobile views. After you save this metric you can then include it in your campaigns report to see the percentage of the campaign that came from mobile. You can also sort by this metric to see what campaign has the highest percentage of mobile usage. 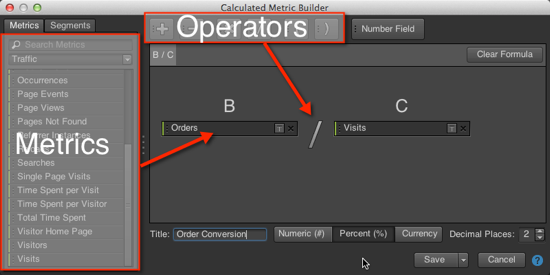 After you start building your calculated metrics you may want to include an existing calculation in another metric. The new builder lets you do that as well. Once you create a metric, as we did with our “% Visits from Mobile” metric it will appear in your metric list with a small chart-looking icon next to it. We will build on this to get the percentage of traffic NOT from mobile. We do this by entering a number field of “1” (red arrow in screenshot below) and then subtract the previously-created “% Visits from Mobile” metric as shown here. You can go on an on but hopefully that gives you an idea of what you could do. That makes for an easy comparison. If you would like to tweak the comparison you can right click on the column header and select edit. I would then modify the comparison as follows to get an (A-B)/B comparison instead of just A/B. Be careful to keep track of what is in your comparison and use meaningful names since the metric doesn’t dynamically reference the columns that it was built from. If you were to switch out one of the original metrics the comparison would not automatically update. That would be a cool feature, though. While this functionality has been in tools like Adobe Insight for a long time I am happy to see it available in Discover. It provides much more flexibility in creating metrics and comparisons. I had a client once in the theme park business that liked to segment their orders by the many different checkout types they had. They could use this to create specific metrics for each type without having to burn up a lot of events. Hopefully this makes its way into SiteCatalyst. Thanks Kevin. Great stuff, and just noticed the calc metrics in discover today, finally! As amazing as this is, I’m dreading the governance issues that are bound to creep up… Naming conventions and common definitions are going to be especially critical (as you point out).